Do you think that king Harald has a influence with his speeches on the political direction Norway takes? 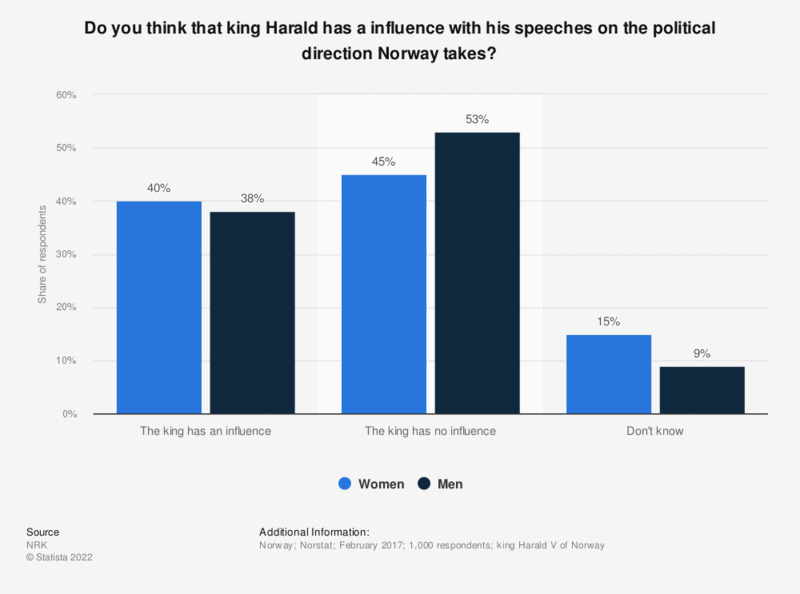 This statistic shows the results of a survey conducted in 2017 on the attitude of Norwegians towards king Harald having an influence with his speeches on the political direction Norway takes, by gender. During the survey period, over 40 percent of female respondents stated to believe that the king has an influence. Roughly 38 percent of men had the same opinion. The majority of female respondents (45 percent) as well as male respondents (53 percent) had the opinion, that the king doesn't have an influence. The original question was phrased by the source as follows: "Mener du at kong Harald påvirker retningen Norge tar gjennom talene sine?" Do you agree or disagree with the following statement: ‘The news media in my country is independent from undue political or government influence most of the time’? Do you think that Russia's power and influence is a major threat, a minor threat or not a threat to Italy? Do you think that the United States' power and influence is a major threat, a minor threat or not a threat to Italy? Do you think that China´s power and influence is a major threat, a minor threat or not a threat to Italy?